alaTest has collected and analyzed 80 reviews of HP Compaq 6005 Pro Desktop PC - AMD Athlon II X2 3.0GHz, 8GB DDR3, 1.5TB HDD, DVDRW, Windows 7 Professional 64-bit, Mouse & Keyboard - RB-6005 Pro (. The average rating for this product is 4.4/5, compared to an average rating of 4.1/5 for other Desktops for all reviews. People really like the size and design. The usability and price also get good opinions. Some have doubts about the reliability. We analyzed user and expert ratings, product age and more factors. 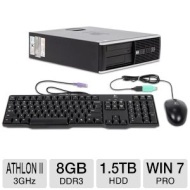 Compared to other Desktops the HP Compaq 6005 Pro Desktop PC - AMD Athlon II X2 3.0GHz, 8GB DDR3, 1.5TB HDD, DVDRW, Windows 7 Professional 64-bit, Mouse & Keyboard - RB-6005 Pro ( is awarded an overall alaScore™ of 85/100 = Very good quality. Bought three. All were problematic. Two were impossible to operate. Trying to return them. Stay away! The computer came in 2 days, good software load, hardware was 100%. No crapware, just as advertised. They could have included a windows disk, but all in all I am a very happy customer. My Dell Dimension 8250 was becoming out of commission, and I needed a new machine to replace XP. I order this machine a week ago and it was delivered in two days. Just set it up this evening. Works like a charm.